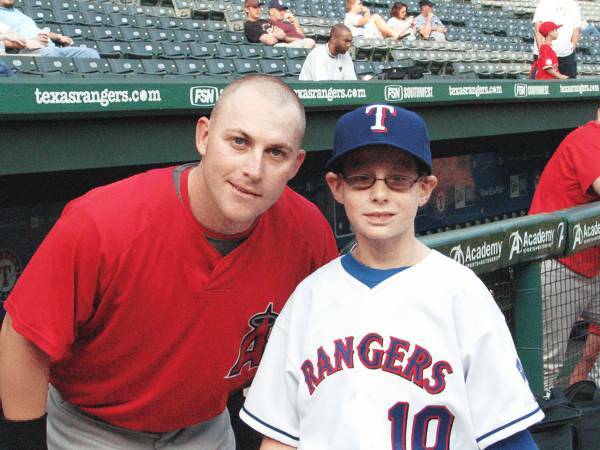 Caleb Spady, a 10 year old with DIPG, dreamed of being a Texas Ranger for a day. On the day his wish came true, the Rangers played the Angels. Reggie Willits, a fellow Okie from Caleb's home county, welcomed him personally and continued his relationship with his young neighbor until Caleb passed away from brain cancer in July of 2009. I’m not a baseball fan—I’ll give you that. Still, I'm also not an anti-fan. I care if my son’s favorite teams win (which means the Red Sox and anyone playing the Yankees) and I like the Angels—because Reggie Willits is a real live angel, that’s why. (See caption at right for proof of this fact.) But no, I didn't watch the 2009 World Series. I did hear it, though; and I heard a lot about it. All this is appalling, but I heard something today that absoflippinglutely blew my mind. If you watched the World Series you noticed that during the game, little banners ran across the top of your screen pulling your eyes away from the batter. Stats of the player? Details about the game? NO! Another dadgum advertisement. You get this right: the $100,000 and up for the actual commercials was not enough! They needed more. What in the Sam Hill? I don't care how much a person likes baseball. This is crazy. Greed. It’s a nasty business.